Ore patch conversion through GUI. Adjustable resource base density on map generation. Too much stone, coal, or even copper on the ore fields? Want to convert them to more useful resources (like iron) in a 1:1 "fair" trade? With this mod, you can perform such ore conversion. 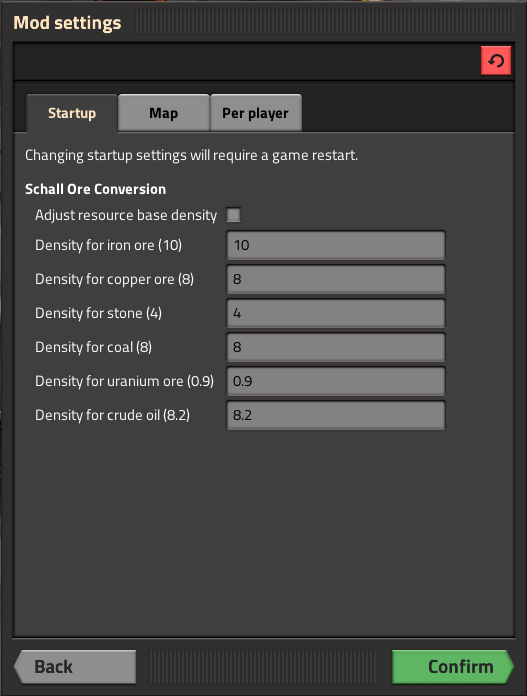 If you feel it is too "cheaty" to convert ore patches in game, instead you can adjust the resources parameters of the map generation script. You can adjust the resources parameters under start menu, go into "Options" → "Mod settings" → "Startup" tab. 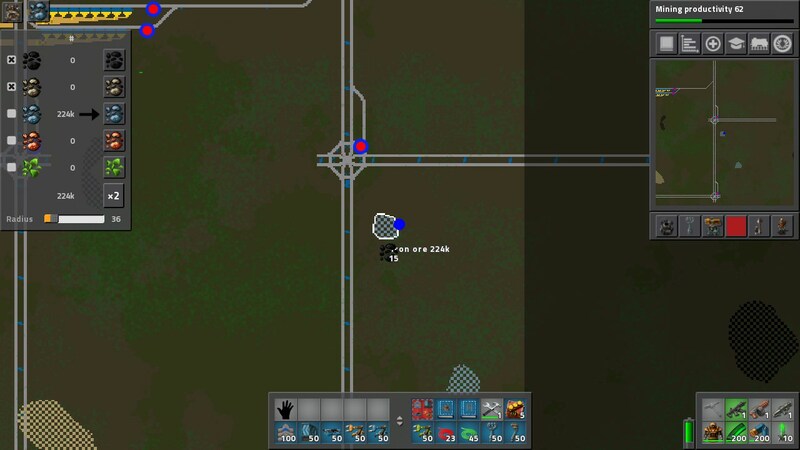 "Base density" is the variable used in game script, denoting the chance (leads to ore field size) the certain type of resource tile would be placed by the map generation script. Base density is non-negative. 0 means NO sources of that type of resources spawned at all, while a higher number means the ore patch will be larger and richer! The checkbox "adjust resource base density" toggles whether the following six values are applied or not. Default is unchecked, which means this part of feature is NOT activated. You will need to tick the checkbox for the changes to be applied. The six base density values correspond to each type of resources. The default values are the original values used by the in-game map generation script. Though the motivation of creating this mod is to have less stone and coal, for more iron, as kind of "fair" trade and balance of resources, feel free to adjust the settings to your taste. You may create some interesting and/or challenging scenarios by having extreme low or high values. Note: Since some resource mods have introduced their own resources generation script, this feature may or may not be completely bypassed. Examples are Resource Spawner Overhaul (RSO), dangOreus, etc. 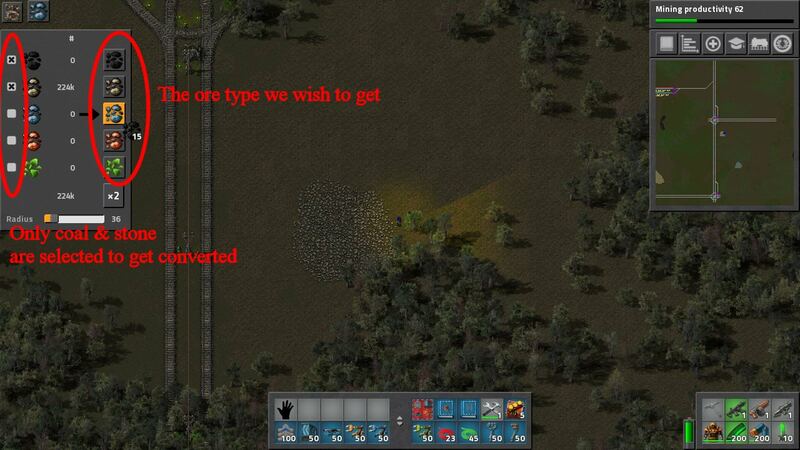 In a game, go near an ore patch that you want to convert. Mine an ore by hand if you do not have any in your inventory. Pick an ore stack in hand (coal and stone are also fine), then an UI button with an iron ore icon will appear on the top of screen. Please click on it to open the ore conversion GUI. 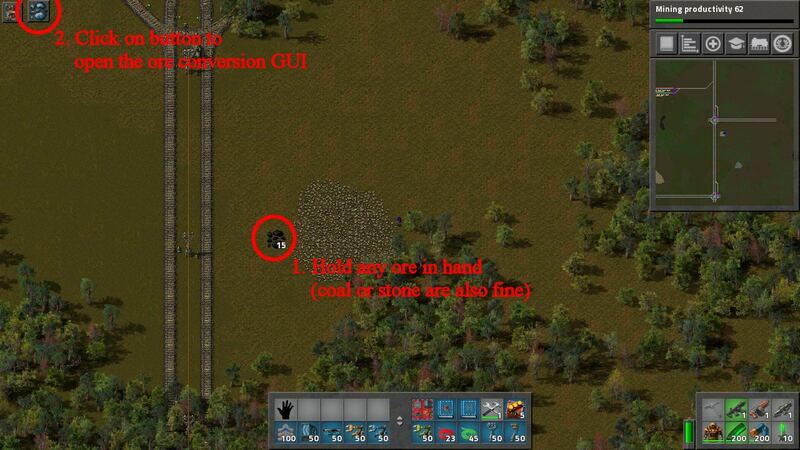 The ore conversion GUI will appear on the left. The radius of selection can be set at the slider. All ore patches within selection will be counted. 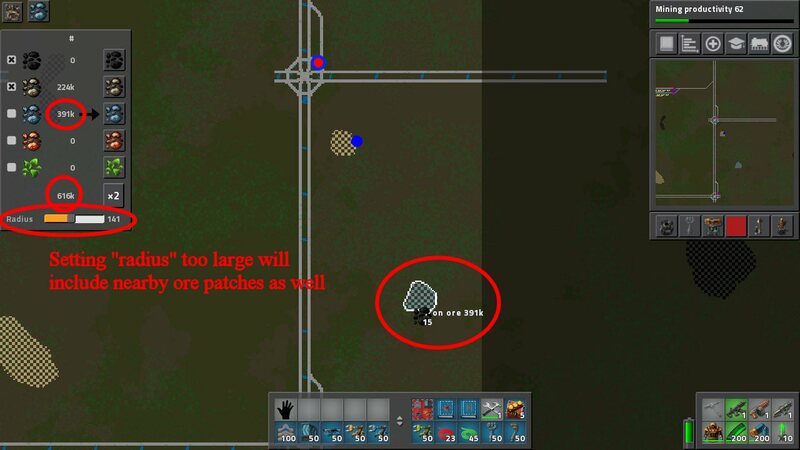 Setting the radius too high may include nearby ore patches as well. Set it to where you wanted. Now we get an iron ore patch instead, the conversion is a success! The only thing added to the game is the ore conversion UI. The UI is added to save file only when the player is holding an ore and the UI is on. Please toggle off the ore conversion UI and cancel holding any ore, then save the game. Then you should have a safe & clean disable/uninstallation of this mod. It is written to include the resources in vanilla game only. If you have any favourite ore mods wanting to be supported, please leave a message in comments section. I will try my best to include them in future versions. Some resources mod like RSO has its own resources autoplace script in map generation, taking over the resource generation part of the vanilla counterpart. The resources autoplace coverage settings of this mod will have no use. 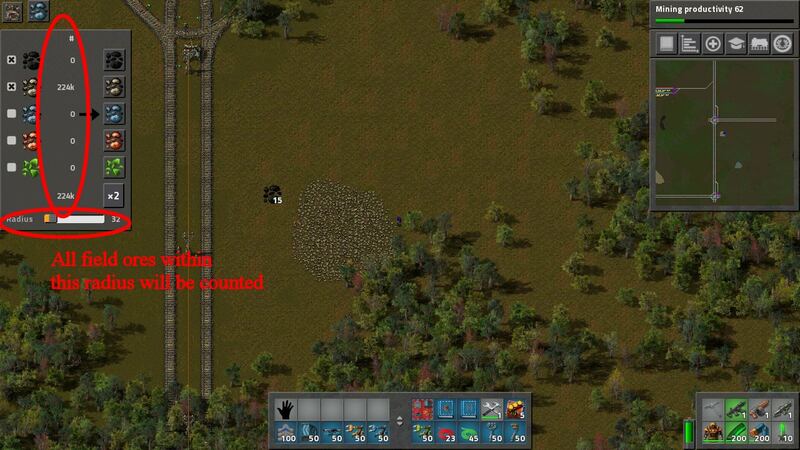 But the in-game field ore conversion should still be working.